No matter what language you use on your site, you should be able to publish from any device. As part of the broader open source community, we believe in building products that people of diverse backgrounds, experiences, and abilities can use and enjoy. We strive to create software that works smoothly for English and non-English speakers alike, and today we’re happy to roll out native support for right-to-left languages in both the iOS and Android WordPress mobile apps. Adding support for languages like Hebrew or Arabic took us longer than we expected. For the past couple of weeks, however, we worked hard to ensure that all elements in our apps are properly mirrored, easy to reach, and provide a consistent user experience that feels natural in a right-to-left orientation. The WordPress app will automatically detect the language of your device and change the interface language accordingly. 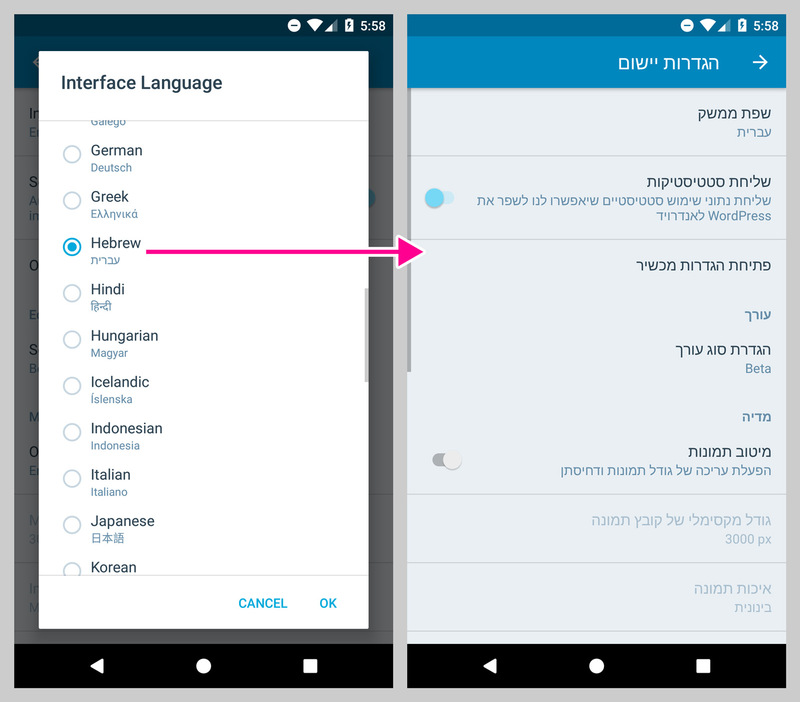 If you want the language of the app to be different from the device language, you can change it by going to Me → App Settings → Interface Language. We hope that this update will take us a step closer to making WordPress the most inclusive and diverse platform in the world. If you use a right-to-left language in one of our WordPress mobile apps and notice that anything is amiss, do let us know — leave a comment here and we’ll try to address the issue as quickly as possible. Shoutout to WordPress for the consideration! I wonder were people complaining about it?? Terrific! Presenting websites that read right-to-left has been a difficult challenge for twenty years. I watched as Japanese writers chose left-to-right for the Web, and Taiwan did the same, officially. A few languages have never had that option, and now WordPress supports them.Thank you. This is a very great and useful update. This is excellent news! I am very interested in making my website available to people who do not speak the same language as me. 1. You cannot edit a typo or small error without doing the whole screenshotted part all again. 2. You may not include links in the screenshot, they must be `open’. 3. A search engine such as Bing or Google will not read text within an image. You will lose much of the publicity for the site. You must find a compromise, WP cannot help, the browsers are at fault.. But for pure Arabic or Hebrew, it is a great idea of WordPress to make this available for the app as it has been for some time in the ordinary computer site. Congratulations! I miss multilingual support for reading. If I search I get only German results even if I use Dutch search terms. Even worse, if I know the name of a blog and google finds it, the WordPress app won’t. And there isn’t even a way for me to change the language.